Romain Ponsart : New life in Colorado - Skate-info-glace ! Monument, Colorado. The small city (pop. 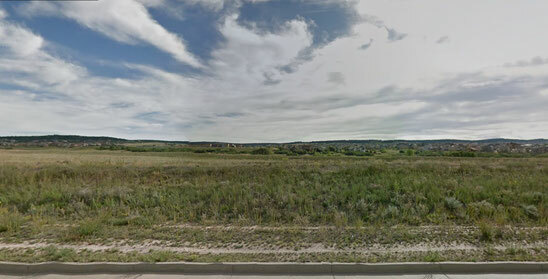 5.000) is located on the I25 that connects Denver to Colorado Springs. Here, you keep it quiet and simple, nothing fancy and posh like in Aspen or Snowmass. 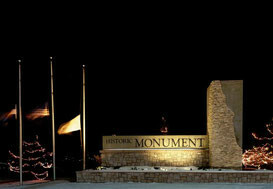 Monument (named after a local rock concretion west of the city) is nestled in dry land and wooded hills, next to the Rampart Range, foothills of the Rockies. One year ago, Kori Ade, known as Jason Brown's coach since his early age, had her "7K International Aacademy" settled at the Colorado Sports Center, on Old Denver Road. 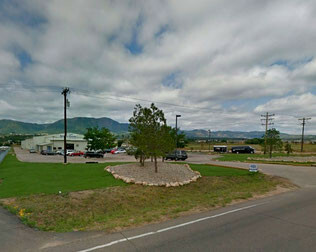 It is the highest training ice center in the United States : 7K for 7.000 feet (approx 2.130 meters). Romain Ponsart joined her team less than one month ago, team made of Rohene Ward, artistic director, Heather Aseltine, administrative director, and also Vincent Restancourt, who, in the past, medalled three times at Junior World Championships and was the first French skater to land a quadruple jump during a competition when he was only 17 years old. This joint effort should assist Romain until the next Olympic Games. - Hello Romain. A few days ago you were competing in French National Championship, and now you are on a short tour. On top of your very recent move to the US, aren't you a bit worn out? True, it is a strenuous lifestyle, packing and unpacking, constant traveling, but I do what I love so I cannot complain. Now [editorial note : Dec 24], I am going back home for Christmas and I will be able to rest for two days! - For once month, you have been working at the 7K Academy co-managed by Kori Ade. Can you describe a typical day of training? For now, a typical day is waking up at 6.45 a.m. At 7.20 I am off to the rink. Once there, days are never the same. Sometimes I start the day working on my skating with Rohene Ward, sometimes I tuck into technique and jumps with Vincent [Restencourt]. We hold a series of different sessions. After lunchbreak, time for a lot of basic work with Kori. I call it a day towards 5.00 p.m.
- Most of French athletes, regardless of their sport, who train in the United States say that the amount of work here exceeds by far what they were used to in France. Do you agree ? Yes, absolutely. Above all, they have another way of working and another way of thinking. And I really like the way they work. I must say that the first week was rather difficult. I was skating my routines but it felt like I could not breath, I was dizzy and all my body was aching. Add to it that when I arrived, I had not skated much since Bompard Trophy, I had only had two short sessions at my hometown rink. We have had to directly cut to the chase in order to present something decent at French Nationals. - How does one decide to go and work across the Altlantic? Did you have time to think about it or it was more like, I'm packing and there we go? I did not expect to leave for the US at all. When Brian [Joubert] and I stopped working together, I did not know what to do. Hang up my skates? Try one last time at Bercy Center? The [French] Federation told me that I could not come back to the center before January, that there was so many people there all the ice hours were already booked, that Claude [Péri-Thevenard] could not take care of everybody. I went back home. One week later, I had a phone call from Vincent Restancourt who offered me to come and train at the 7K Academy. I asked myself the right questions. And of course, I said yes right away ! Working with such a team and with Jason Brown is an incredible opportunity. But we had a very short time window, Nationals were only three weeks ahead, so I jumped into a flight to the USA. - Who do you share the ice with? Mariah Bell, Jordan Moeller, Ben Jalovick, Courtney Hickx occasionnally, and of course Jason. And others but I don't know all the names yet! - What is Vincent Restancourt's role with you? Technique ! We work mainly on the quad. Often, I have sessions with Vincent, then I work on my routines with Kori. - Vincent says that you are motivated and truly passionate about your sport. What is your main driving force, what keeps you moving forward? I simply enjoy skating, I always try to push my limits, that's my driving force. - You suffered an injury that kept you off the ice in 2013/2014. Is it completely healed? - What do you consider to be your strongest point on the ice, technically and mentally? My strongest point has always been my artistry, and mentally, the support of my family and of the . audience are the best things. - On the other hand, your weakest point? It has become a bit difficult to deal with my stress level. - We are used to see you skate to classical themes. Is it your thing or is it the choice of your team? I am starting to be a bit tired of classics. I have a hard time enjoying my LP this season so I don't think I'll choose classical music next year. There still is a piece for which I have a particular liking : La Tosca, but I already skated to it in the past. But yes, I'm often the one who make the choices. I'm submitted a few different pieces and I choose the one I like the most. - Is there a particular song, a tune, a theme to which you would love to skate? No, nothing special. The only thing I dream of, is to skate a top clean program at a big competition and to get a standing ovation. It is really a big dream for me! - Off ice, what kind of music do you like? Everything ! Rap, pop, old stuff. But I confess I have a particular liking for Chris Brown. - Is there an element you love to complete or, on the contrary, that you hate? I hate the loop ! And the best feeling is the quadruple jump, you feel like you're flying, I love it! - Is it a benefit or a drawback to be tall when you are an individual skater? I think it is a drawback for the jumps. It is easier for a skater with a small built to fix a jump gone askew. But being tall is an advantage when it comes to artistry. - What drove you to figure skating in the first place? I started when I was 7 years old, after I attended a gala where Eric Millot was skating. He is the one who made me want to skate! - In figure skating, do you have a model, a childhood hero? I was a great fan of Alexeï Yagudin and Daisuke Takahashi, they have such a presence on the ice when they skate! - Yuzuru Hanyu, three quads in a free program, his huge marks, what does it bring to your mind? It feels like he will never stop improving, he looks made on measures for figure skating. But I think that above all, he must work like crazy! I hope his body will hold, he has a small built. - You have always been very elegant on the ice, even when you were very young. Is it inborn or did you work on it? I worked on it a little bit when I was small, but it's mainly natural. - When you were still a junior, I overheard a coach calling you "the little Lambiel", because of your silhouette and your spins. Deep within you, you feel more like an artist or like a technician ? In figure skating, I really love jumps, but still, it is an artistic sport. I cannot imagine skating and only doing jumps, not giving anything to the audience. The audience is there to have stars in their eyes both because of the artistry and the technique. Consequently, you have to deliver it all. But with me, true, artistry is more developed than technique. 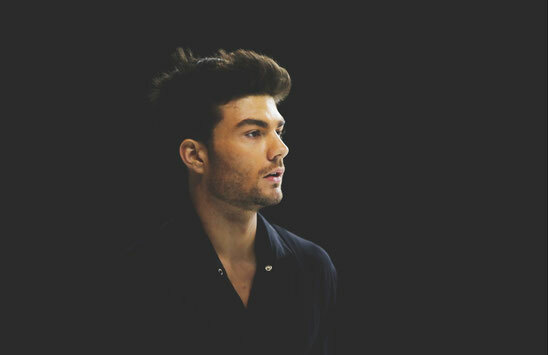 And I've often been told I looked a bit like Lambiel. - On and off ice, you run more on feelings or on reflection ? Instinct or headache ? I am a guy who think a lot, and unfortunately, when it comes to sports, it's not always a good thing. Nowadays, I try to dwell less about stuff and to enjoy what I do more. - In life, what is your bigget flaw? And your best quality? - You wake up tomorrow morning, 10 years have passed. And you are a coach! Wo do you select as your trainees among French and foreign skaters? You can take as many as you want, ladies, men, pairs, ice dancers. Ouch, this is a difficult question. First, I wouldn't coach pairs or ice dancers because I know nothing about their discipline! No particular name comes to my mind, I would just like to work with a small group of motivated kids in a cool atmosphere, kids who really wants to work and improve! - What did you study at INSEP , and do you have a career plan for after skating? I got my "BAC" [school-leaving qualification] and I studied architecture. For now, I'm not thinking of what will happen after skating. But there is something I would love to do : choreography ! - Florent [Amodio] will retire after Euros, that leaves a spot for Worlds in Boston and it should logically come back to you. You have some time left to polish your programs. Upon what are you going to focus? - The theme for this new free program ? Emotion ! It will tell about these last years and what I have been through. - Financially, are you supported by your federation? If not, how do you manage? I hear that, in Colorado, you have a sponsor? No, I have no support from the federation. But I'm not taking care of that, Kori, Vincent and Rohene do, they are really great, yes, they found a sponsor for me. - What is your biggest dream? Going to the Olympics? Leaving a mark in your sport? Yes, my biggest dream is to go to the Olympic Games! I would really love to shine at next Olympics and first of all, to enjoy my skating there! - You are sent to a desert island (where there is no skating rink) and you can bring only one thing with you. What do you take? - A word as a conclusion? The choice is yours. Several! I want to thank all the people who sent me messages of support during this rather complicated period. I thank all those who are always there when things are good or bad. Whatever happened, I have no regret since all the good or bad choices I made led me to work with the 7K Academy team and this is an incredible opportunity for me! I won't regret even if it doesn' work because I will have tried! See you soon!